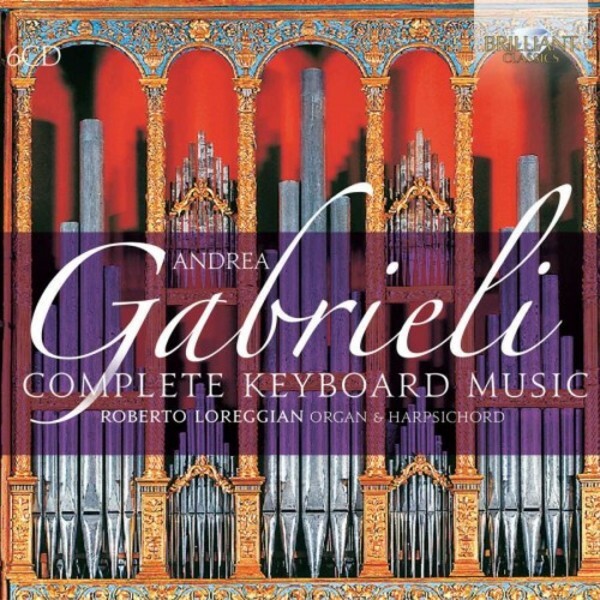 The first complete recording of the keyboard works of Andrea Gabrieli (1532-1585), one of the most famous and influential composers of the late Renaissance and the most important representative of the Venetian School. A native of Venice, he went to Germany to study with Lassus. Later he became organist of the famous San Marco in Venice, the most important post in Northern Italy at that moment. Gabrieli was one of the first composers to write purely instrumental music. His works for keyboard (organ, cembalo) consist of Ricercars, a monothematic form which is the forerunner of the Fugue, brilliant and virtuoso Preludes and Toccatas, and lavishly ornamented arrangements of madrigals and other vocal works. Italian Roberto Loreggian is one of the foremost keyboardists of this time. His extensive discography includes the complete keyboard works of Frescobaldi. He plays the wonderful, recently restored historic organ of the Duomo of Valvasone.